Little concrete information has been found about Peter McPherson. The family story is that he was of U.E.L. origin, and that an uncle swindled him out of his land. The other story is that he was killed by a runaway team. 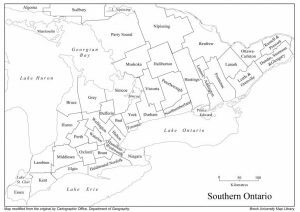 The only official piece of information that has been found is the marriage of Peter Mcpherson to Susan Bamford on Feb. 10, 1846 in the Gore District of Ontario. They had two daughters, Annie b. 31 December, 1847 in Brantford and Jennie (or Jane), possibly born in 1849 in Norwich Twp;, Oxford County (Brock/London District). In 1855 Annie McPherson was baptized at the age of eight at Grace Church, Brantford. According to census data, Susan Bamford was born in Ireland in 1818. Peter was born in Scotland. Susan remarried Robert Campbell in 1856 who lived on lot 18, South of the Durham Road in Bentinck Township. In the 1861 census Jane Mcpherson, age 12, is living with Robert and Susan Campbell, and John S. Campbell, age 5. John S. became a teacher and drowned at the age of twenty-five leaving a young wife, Flora McArthur. In the 1891 census, Jennie McPherson Patterson, widow with four children, lived in Thessalon where she was an innkeeper. Thomas Moore is on the same census as “bartender” and Susan Campbell is listed as “mother”. Susan Bamford McPherson Campbell died 6 July, 1894, at Thessalon, Ontario from insanity, duration 4 weeks. (At the same time Annie McPherson Milligan and her family were living on Manitoulin Island, which is close to Thessalon). By 1901, Jennie had married Thomas Moore and he is listed as “innkeeper”. Witness at Annie McPherson’s wedding March 1, 1864 was Annie Bamford. Annie Bamford married John Leeson 1866. She died September 25, 1917, aged 68 years. 3. In the West Bentinck Presbyterian Cemetery, Grey County, where William Milligan and his family are buried, the Leesons and Bamfords are also buried. Both Annie Leeson (senior) and her daughter Jennie died of tuberculosis (see Ontario death certificates). Source Bibliography: OLSON, VIRGINIA H. “Notes and Sources: Connecticut Loyalists Who Went to Canada.” In Connecticut Ancestry, vol. 17:1 (Sept. 1974), pp. 18-25; vol. 17:2 (Nov. 1974), pp. 51-59. Ancestry.com. U.S. and Canada, Passenger and Immigration Lists Index, 1500s-1900s [database on-line]. Provo, UT, USA: Ancestry.com Operations, Inc, 2010. Original data: Filby, P. William, ed. Passenger and Immigration Lists Index, 1500s-1900s. Farmington Hills, MI, USA: Gale Research, 2012.